Owners of Short-Term Rentals (STRs) are required to obtain an operating license annually (Ordinance No. 20160223-A.l). This law applies to all properties (including rooms and guest houses) rented for less than 30 consecutive days. Find out what type of Short-Term Rental you have. Click this link to find the short-term rental license application for your type. Cash, check or money order payable to the City of Austin. The application fee is non-refundable. To obtain your Certificate of Occupancy please call the Development Services Department at 978-4000, or contact by e-mail at DSDHelp@austintexas.gov. All 3rd Party Agents must have Notarized authorization from Owners allowing them to manage property. Drop off: You may alternatively visit our office at 1520 Rutherford Lane, Bldg. 1, Austin, TX 78754 between 8:00 a.m. to 3:00 p.m.
Online: Click here to visit the new online registration and renewal website. Questions? 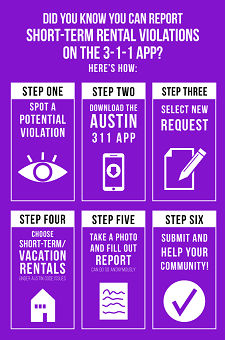 Email STRlicensing@austintexas.gov or call 512-974-9144.
Credit card, cash, check or money order payable to the City of Austin. The application fee is non-refundable. The license must be renewed before it expires. If the owner and/or street address of the STR have changed, you MUST submit a new application with signatures from all owners and the owner’s agent, if applicable. If other application information has changed, the information must be sent in a letter signed by the owner, without having to submit a new application. To renew the Operating License of your Short-Term Rental (STR), the required documents and licensing fee can be mailed, brought in to our office, or submitted online.